Welcome to the first day of the Six Ingredient Challenge! We're spending six weeks buying foods with six ingredients or fewer. To make your transition easier, Amy of Anktangle and I are offering some recipes for simple homemade versions of (often highly processed) store-bought foods. Today Amy is sharing a simple chicken stock recipe and a helpful tutorial for how to make it over at Anktangle. 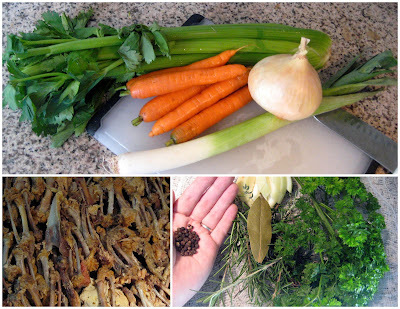 She has photographs and detailed instructions on how to prepare this hearty staple, as well as a few options for preserving stock for later use.